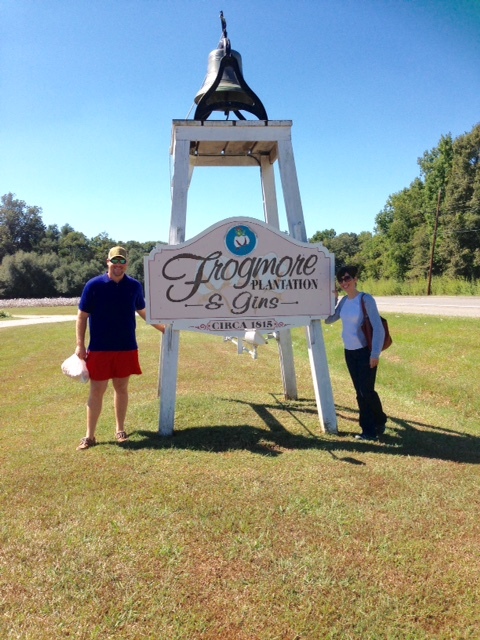 My husband and I recently celebrated our 5 year wedding anniversary in Natchez, MS. 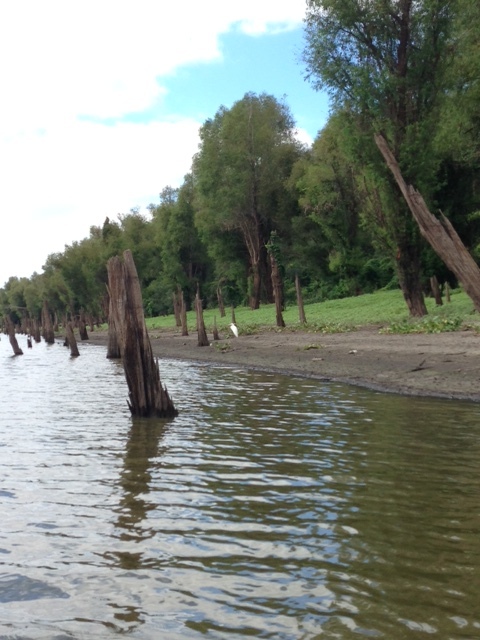 If you can survive this EXTRA-LONG post, you will learn the ins and outs of our trip which I’ve now tagged the Natchez Skinny. After a short 2 hour drive from Prairieville, we pulled up to The Elms at 800 Washington Street, Natchez, MS and admired this magnificent mansion in all its glory. 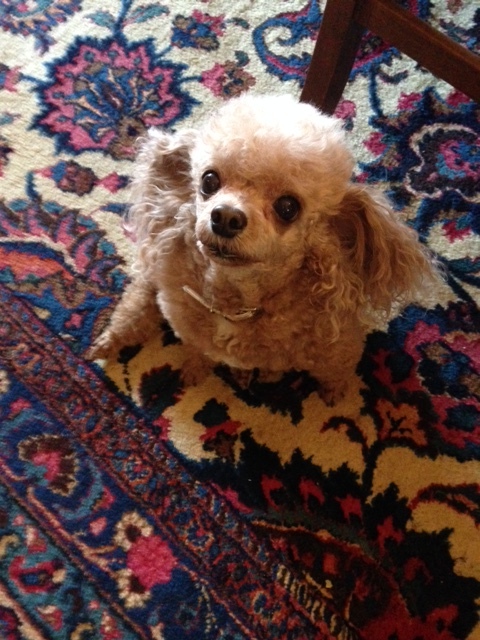 Whether it was the inviting rocking chairs, the wrap around porch, the house poodle Lucy greeting you on your arrival or the ever so charming Esther Carpenter (owner), you felt at home the second you walked through the door. We stayed in the Kellogg Room and lived in bed and breakfast luxury for five days. I couldn’t get enough of the relaxing claw foot tub and the plush robes that were provided to us. Esther took care of all the details during our romantic stay, from fresh flowers to fresh desserts on the porch and a full southern breakfast each morning with other engaging guests. The large wrap around porch with its beautiful views of the oaks and elms that covered the estate was one of my favorite parts of The Elms. Esther is a chef and an artist which was apparent by the unique starburst lights that hung in the oak trees throughout the yard. It was a magical sight watching them come alive each night. Needless to say, we enjoyed every minute of our stay. Because we have never visited Natchez before, our first stop was the Natchez Visitor’s Center which sat on top of a large bluff, overlooking the mighty Mississippi River. I was extremely impressed with the educational resources available and the sheer beauty of the view. 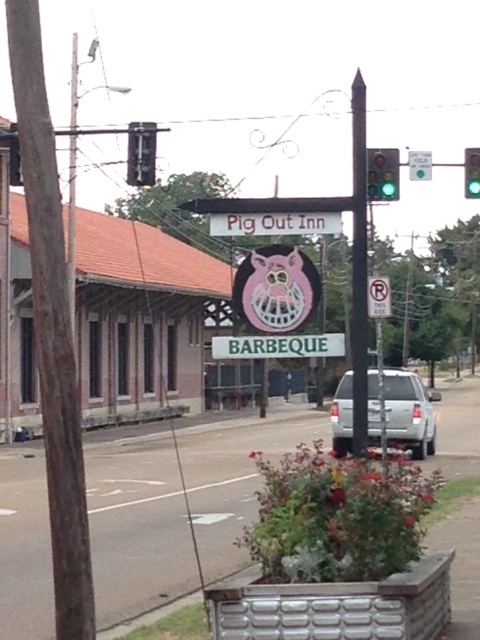 If you ever visit Natchez, this should be your first stop. 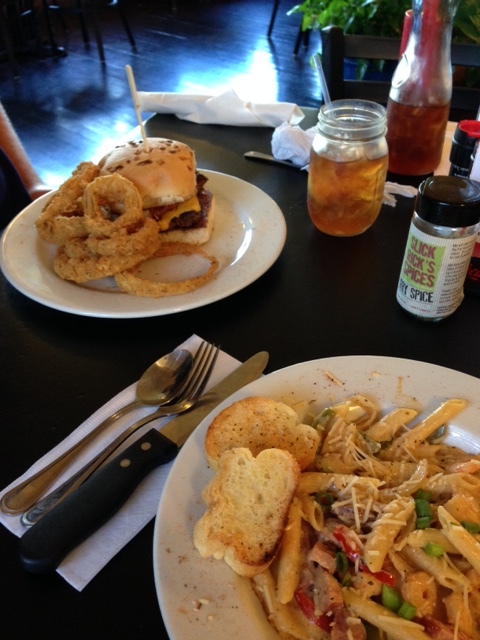 The clerk at the visitor’s center directed us to a quaint little spot for dinner called Magnolia Grill located Under the Hill and she made sure to recommend sitting on “the porch”. We soon figured out why the porch was in high demand. You notice pretty quick why that area is named Under the Hill as you trek down a steep incline and look up to see the bluff towering above you. Back in the 1800’s, this area was frequented by gamblers, prostitutes and kinds alike. The more prominent people lived in mansions and large estates up on the bluff. 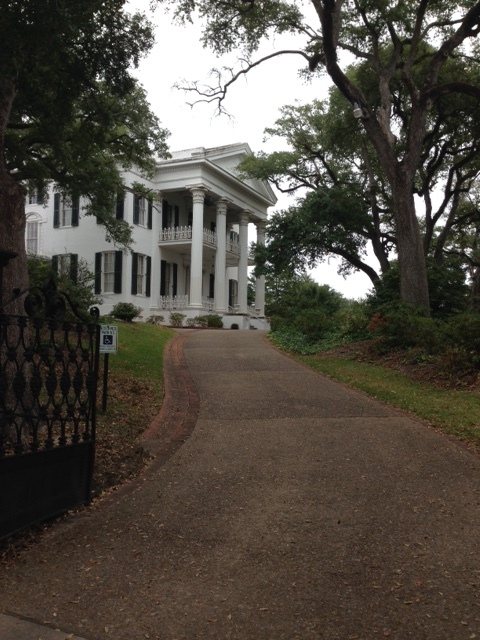 Today Natchez Under the Hill is a big tourist attraction and has a great selection of restaurants and taverns to enjoy. Andrew ordered the grilled quail and I ordered BBQ shrimp but the best part of our meal was the homemade Buttermilk Coconut Pie. It is a custard consistency with just the right amount of coconut to excite your taste buds. 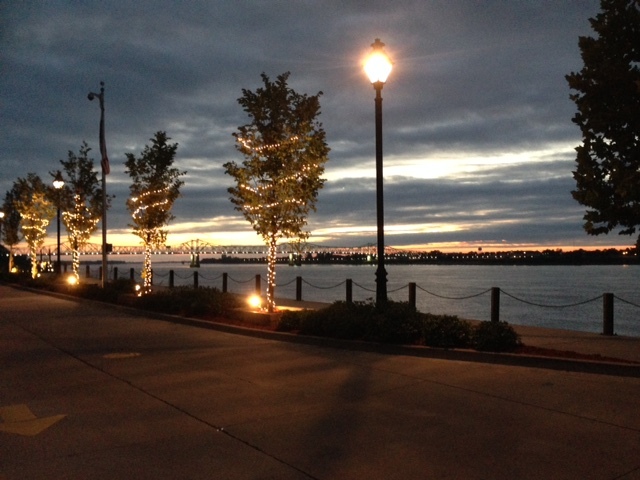 The view of the Mississippi River on the porch of the restaurant was spectacular and the evening stroll afterwards to work off all the calories was practically a scene out of a movie. Before the evening was over, we decided to stop by Forks of the Road which is the site of several markets where enslaved humans were bought and sold from the 1830s until 1863. 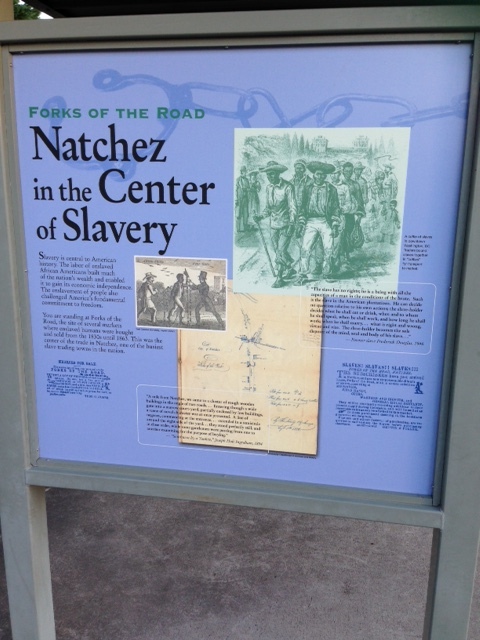 Natchez was one of the busiest slave trading towns in the nation. 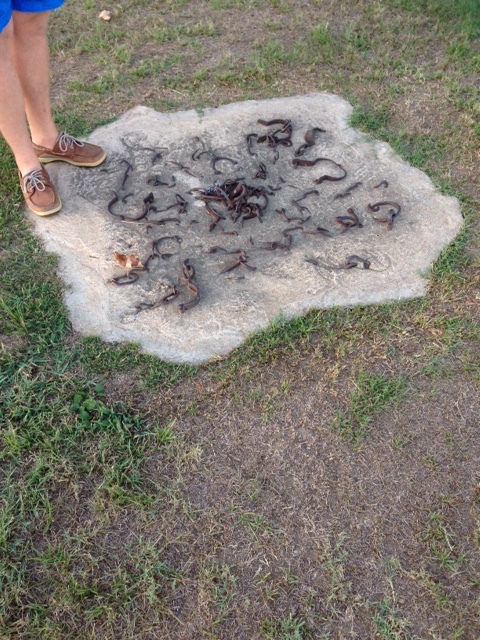 Over in the corner, we noticed cemented into the ground iron shackles that were used to bind the slaves together during transport. Standing on that piece of history brought such an overwhelming sense of loss and sadness while I thought about people being sold like cattle to the highest bidder, without any say in how their life would turn out. After reading different slaves’ accounts documented on display boards at this historical landmark, I walked away with a deeper understanding of the struggle and desperation of the enslaved people. 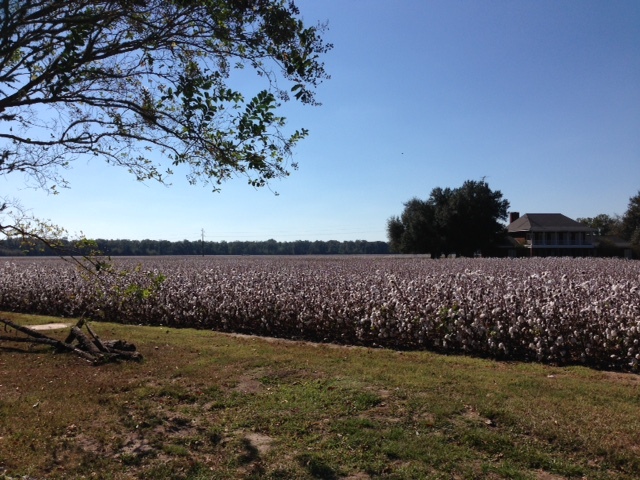 We celebrated our anniversary on day 2 of our Natchez excursion by heading across the river to Frogmore, LA (outside of Ferriday, LA) where we toured Frogmore Plantation, an active cotton plantation. The countless rows of cotton were absolutely breathtaking. Our tour guides covered the history of cotton, then and now, explaining the evolution in cotton production from slave labor to the modern day cotton gin. Learning about the slaves living conditions and work life on a cotton plantation was an eye opener for me. It put into perspective how difficult life was then and how hard people worked for their meager wages. Things have changed so much and we really don’t know struggle like that anymore. On our route back to Natchez, we stumbled across Johnnie Mae’s in Vidalia, LA. Not only was the food top notch but the creative and unique décor was fun to examine over lunch. Andrew ordered the Vidalia Burger which was a delicious stack of Andouille sausage, American & pepper jack cheese, onion, pickles, tomatoes, & BBQ sauce, all on an onion sourdough bun. I ordered the Pastalaya which had just enough kick to satisfy my craving for the day. The homemade peach bread budding with caramel sauce was top on our dessert list for the trip. Because of all of the eating we had been doing, we needed a caffeine pick me up and found Steampunk Coffee Roasters. 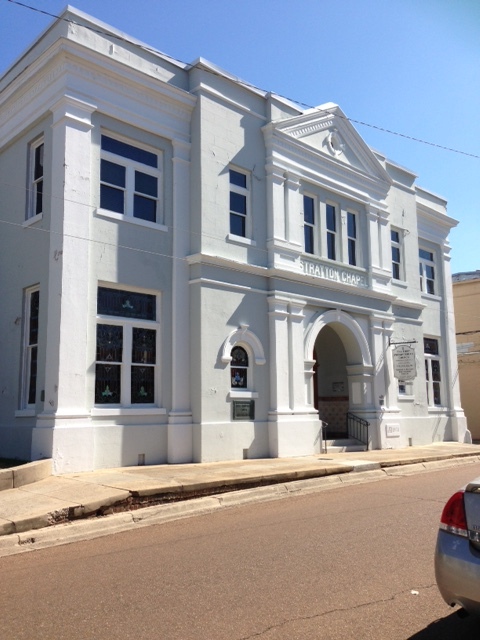 It is located at 114 High Street in a brick cabin, circa 1868. The centerpiece of this coffee house is a gorgeous brass espresso machine and industrial design décor. The espresso and specialty brewed coffees and teas are out of this world. We made a pit stop for our daily cup of coffee every afternoon. I even picked up some burlap coffee bags they sell for $5/each. I have a few creative ideas for these burlap sacks. I highly recommend stopping by for a cup of their joe anytime you are in town. Since we had a sudden burst of energy, we headed to Bowie Outfitters flagship store. 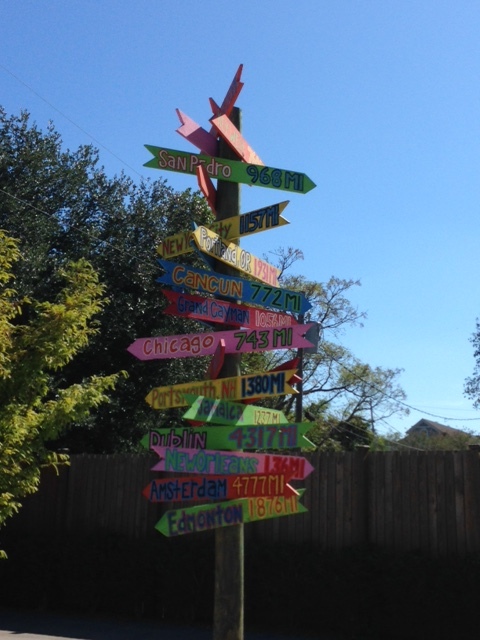 Andrew was disappointed because it was significantly smaller than the Baton Rouge location back home. 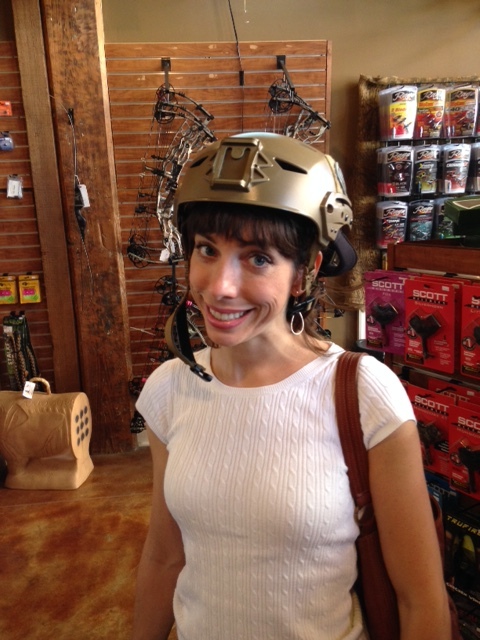 That didn’t stop us from getting into the tactical equipment and having some good laughs. Our final celebration for the night was dinner at Monmouth Plantation, an early 19th century antebellum mansion set in 26 acres of manicured gardens. The cuisine was exquisite at their Restaurant 1818 and the romantic atmosphere was exactly what you would want for a milestone anniversary. After enjoying a meal of grilled duck and a 6 oz filet with mushroom sauce, we decided to enjoy homemade bread pudding with homemade vanilla ice cream for dessert. 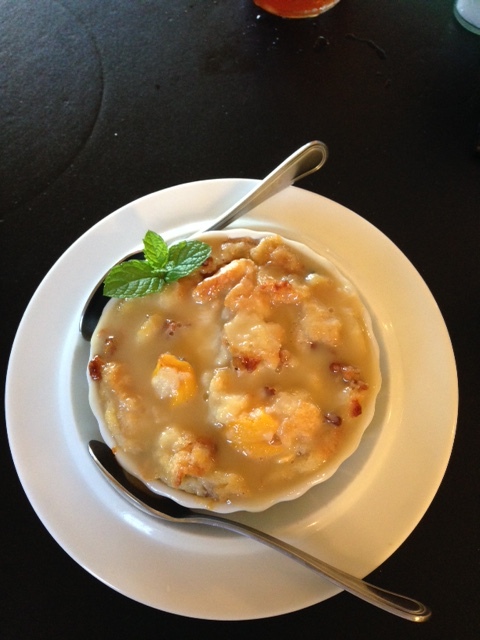 That makes 2 bread pudding desserts in one day and it was totally worth it. Are you starting to realize this trip has begun to sound like a foodie crawl? Yes, we started to realize that as we were stuffing our faces with one good meal after another. And again, it was totally worth it. Day 3 of our Natchez excursion included lots of physical activity which was exactly what we needed after eating non-stop for the first couple of days. 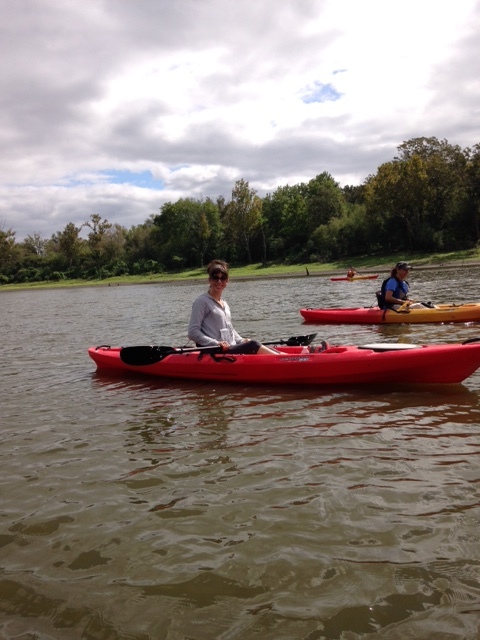 We booked a kayak trip of Marengo Bend with Lena McKnight of Everyday Adventure, LLC. From beginning to end, Lena and her husband Tim were amazing. They picked us up at our bed and breakfast, brought water for our adventure and unloaded everything for us as well. 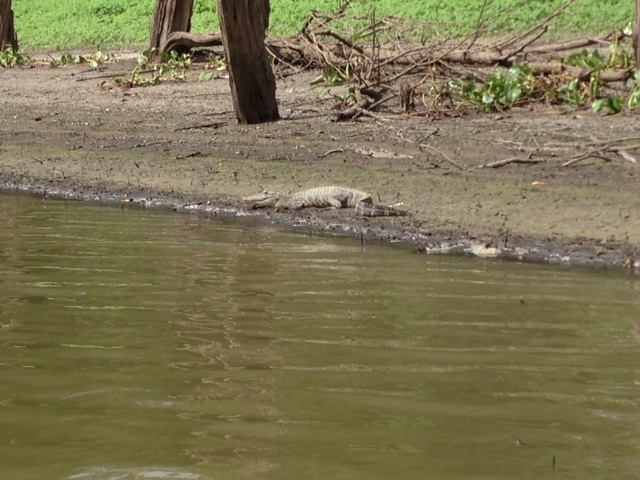 Serene views, alligators, egrets, cranes, deer and turkey were all part of our experience on that oxbow lake. 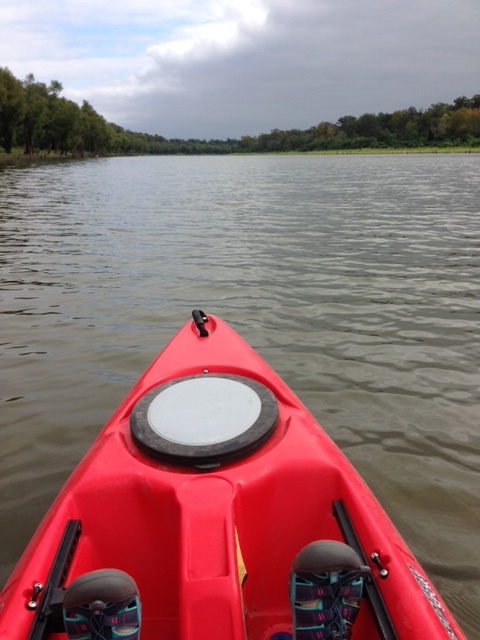 When the clouds parted mid-morning, I sat back in my kayak and took in all of God’s beauty before me. You truly feel the presence of God’s blessing upon your life when you are in a place like that. To have breath of life and to share this experience with Andrew and this wonderful couple we just met was memorable. When looking back on that morning, I realize that Lena and Tim’s warm spirit and love for the outdoors made the adventure that much more enjoyable. 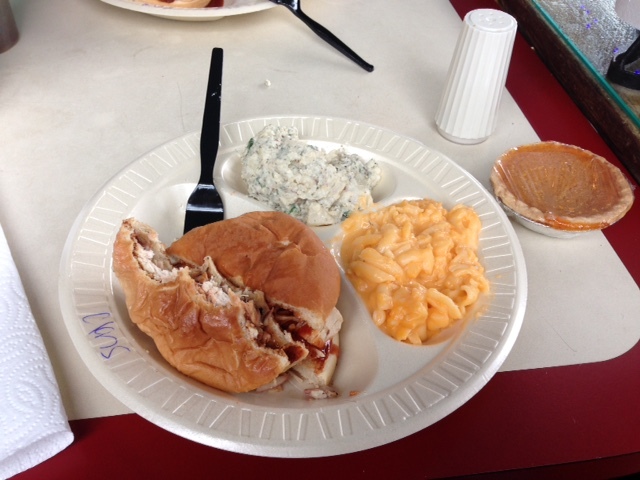 On our way back into town, we stopped at Pig Out Inn and indulged in some smoked chicken and brisket with all the delicious homemade fixings of mac and cheese and potato salad. 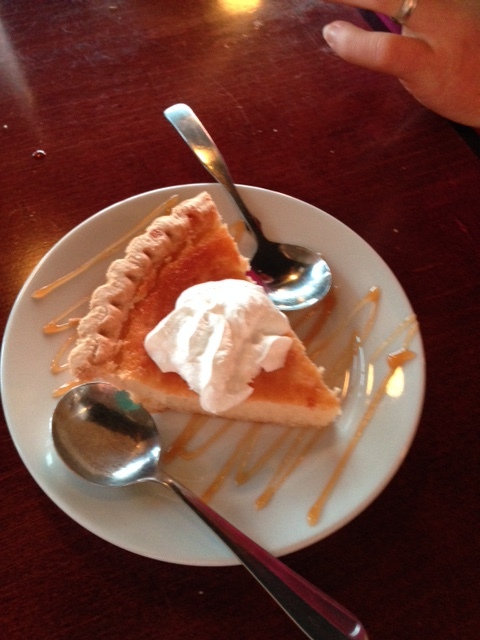 Of course I had to try their homemade sweet potato pie which didn’t disappoint one bit. What’s really nice about these pies are their petite size – perfect for a small sweet bite. Our final event of the day was a complete surprise to me. I had sort of an idea since Andrew instructed me to change into jeans and cowboy boots which peaked my curiosity. We drove around the Homochitto National Forest hills, down gravel roads, traveling farther and farther away from civilization. The trees created such beautiful canopies above the roads. 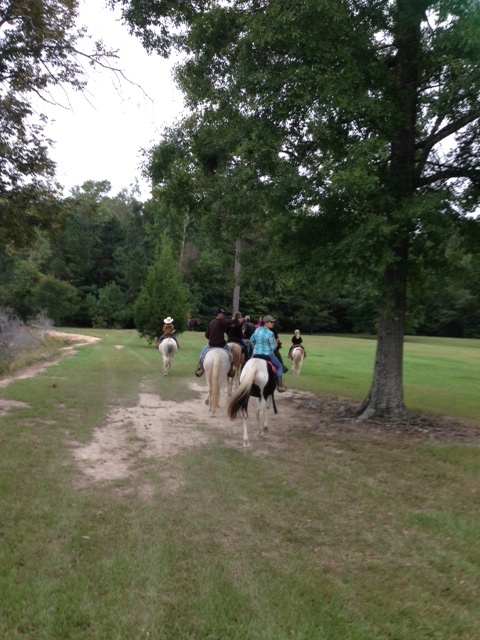 We finally pulled into Brushy Creek Ranch and I realized we were going horse-back riding! 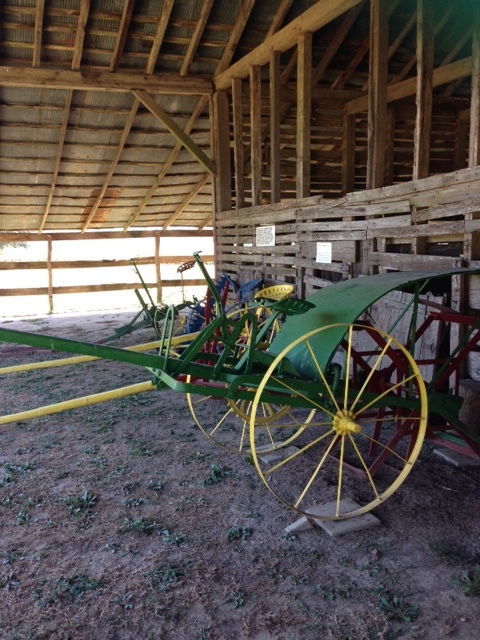 The ranch is 54 acres but is surrounded by 200,000 acres of the Homochitto National Forest. This forest is your wonderland out there and it is truly beautiful. 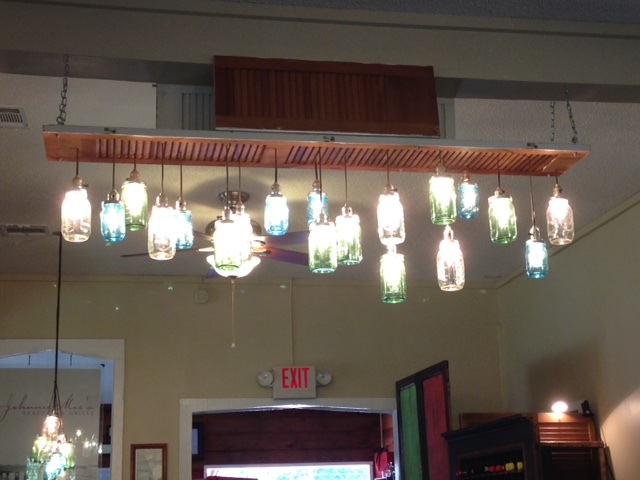 The owners Chris and Ashley Kimble were so friendly and made us feel like part of the family. 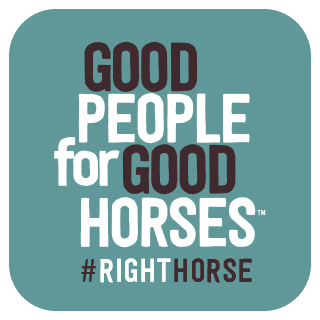 They recently purchased the ranch and have a background in marriage and family therapy with the hopes of introducing equine therapy as part of their process. 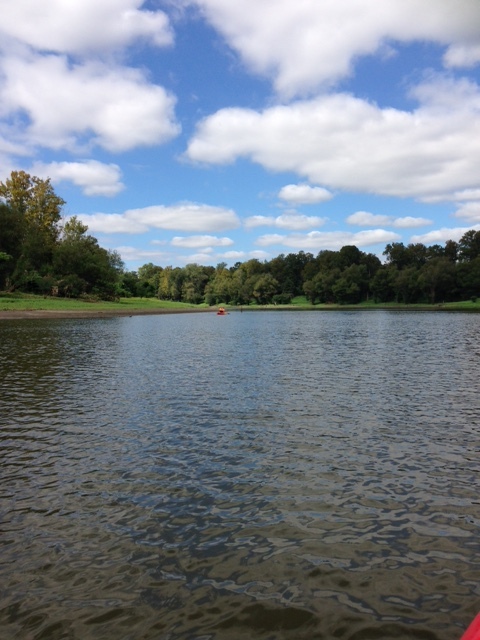 Campgrounds and cabins are available for overnight stays, and a pool and 2 large ponds create a nice weekend getaway spot. 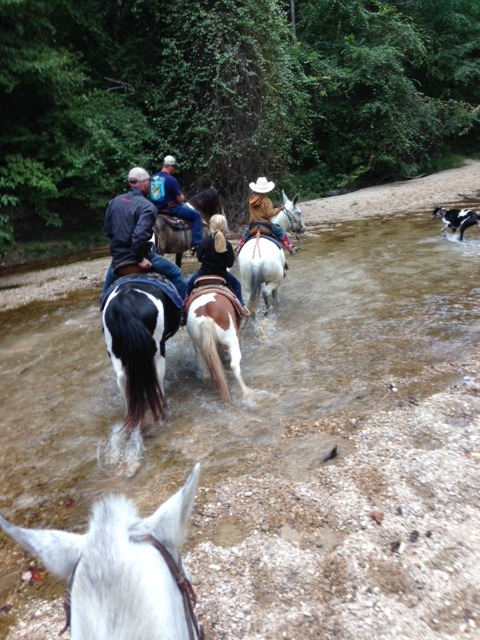 I rode Pepper and Andrew rode Trixie. They are friends in horse land and you could tell because they kept close to one another most of the time we were on the trails. It was a precious friendship to watch throughout the ride. I don’t think words can express how much joy and happiness that afternoon brought to my life. Riding through the forest on that beautiful horse, with all of his strength and glory, was a feeling I really can’t describe. This past year has been one of the hardest years of my life but also a year of self-discovery, learning to love myself, accept myself and to surrender my burdens to God so that He can carry them for me. All of those struggles disappeared that afternoon. There were moments when Pepper and I were galloping through the forest, gaining speed with each step and I felt an incredible freedom from the stress of everyday life. Nothing else mattered at that moment but me and Pepper. It was a spiritual experience and brought tears of joy upon leaving that special ranch. I left a piece of myself in those woods and I plan on returning to find myself again. Our evening dinner hangout was Fat Mama’s Tamales in Natchez. 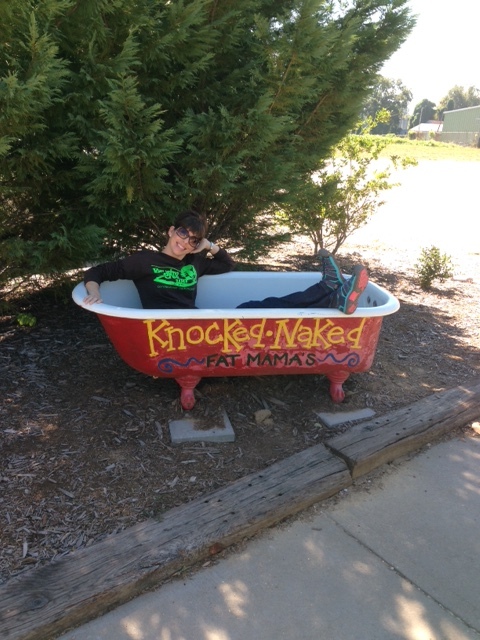 It is an interesting hot spot with its lush landscaping and painted tubs out front. Andrew and I both enjoyed a Gringo Pie which includes 3 tamales topped with shredded cheese, homemade chili, diced onions and jalapenos. Although we didn’t try a sample, they are known for their Knock You Naked Margarita – sounds deadly. We were able to enjoy the tail end of the LSU/Eastern Michigan game and met a sweet couple from Denham Springs, LA which is right around the corner from us back home. One thing you will want to try if you ever stop by this establishment is their homemade Lemon Icebox Pie. It has a graham cracker and custard crust and I really could have eaten an entire pie. It was that good. 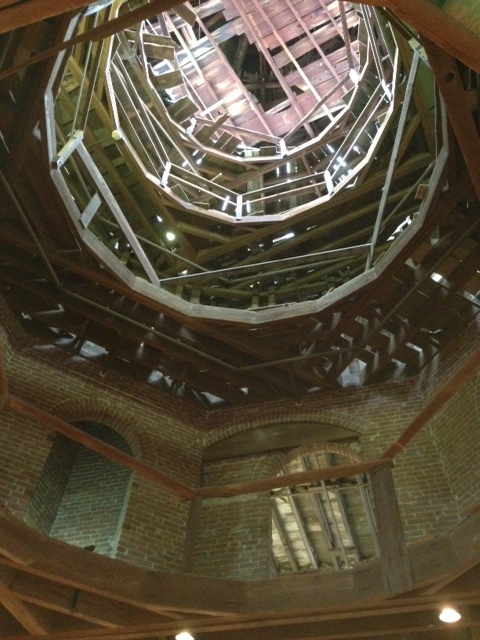 Day 4 of our Natchez excursion was a slower day for us. It was Sunday and Natchez basically shuts down. 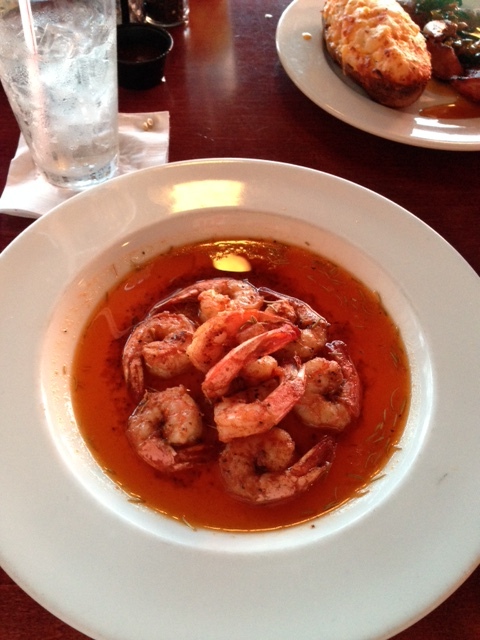 The only places really open were the antebellum homes and a small selection of restaurants. We did take a tour of Longwood Plantation which proved to be a sad story of the Nutt family that lost everything in the war and had to live in the basement of their mansion because the remaining portion of the house was unfinished due to lack of funds. The mansion remains unfinished today and stands as a reminder of all that was lost in the war. 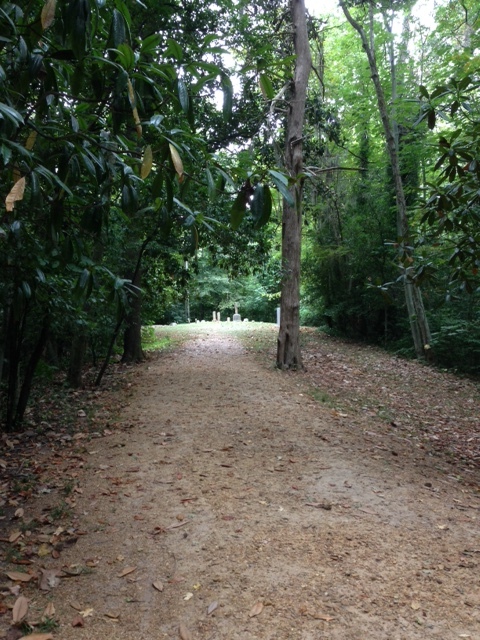 There is also a family cemetery on the stunning grounds. 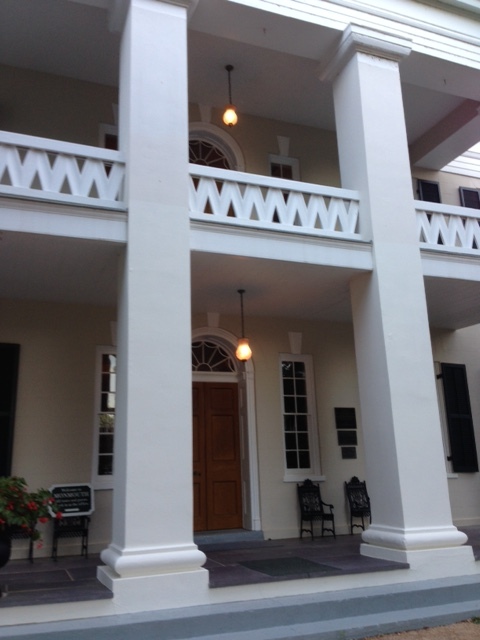 For our lunch destination, we enjoyed a brunch buffet at the Carriage House on the grounds of Stanton Hall, circa 1857 and another example of antebellum splendor. 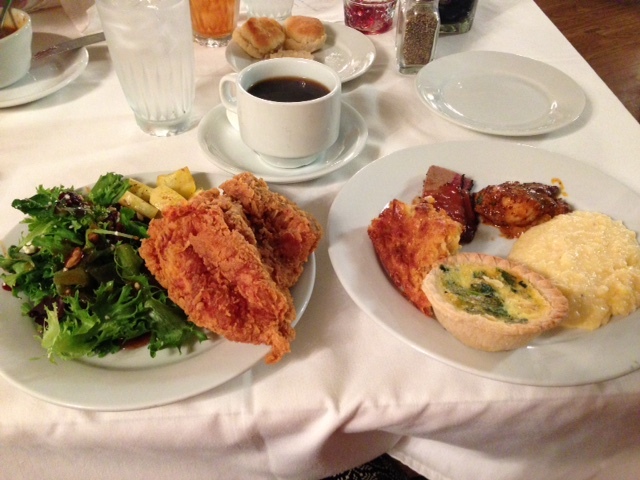 The buffet was a wonderful array of southern cuisine and as you can see, I was in the mood for fried chicken but also enjoyed the grilled red fish, cheese grits, brisket, sweet corn casserole and a spinach and cheese quiche. It was definitely more a lunch brunch rather than a breakfast brunch which I was in the mood for anyway. 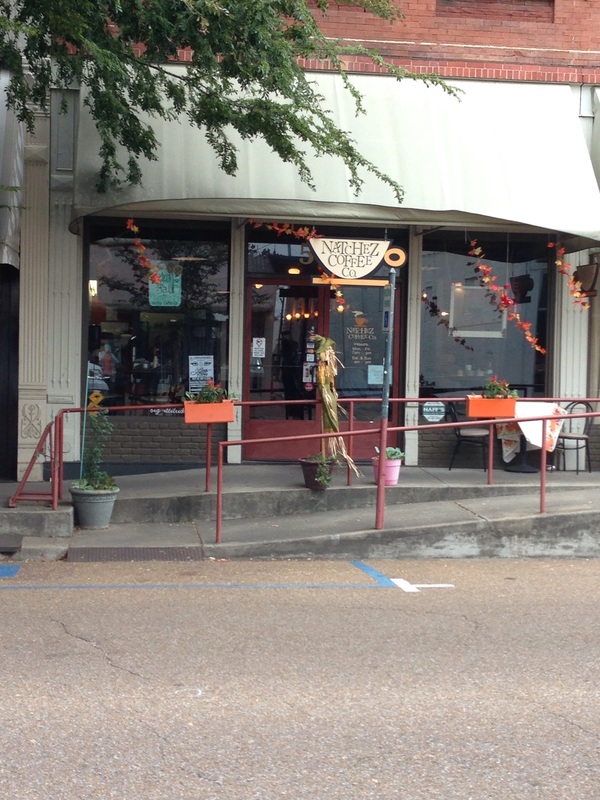 We skipped dessert because I had a special coffee shop and bakery in mind, Natchez Coffee Company. 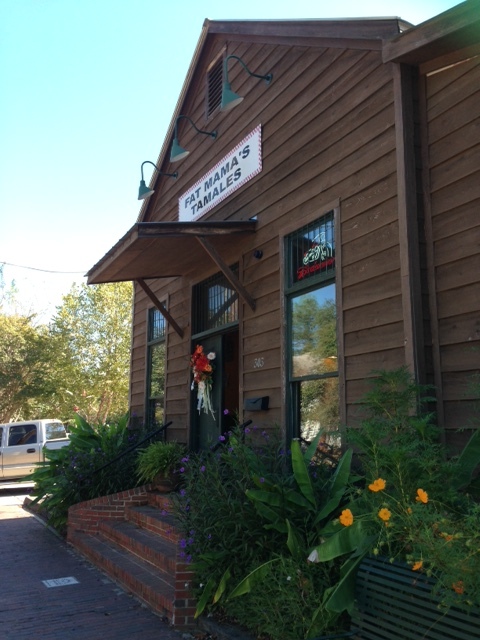 We enjoyed espresso, pecan praline coffee and some of the best baked goods. I tried the red velvet cake which towered tall with cream cheese icing and Andrew tried the lemon delight. It is apparent that Andrew really enjoys lemon pies or anything lemon for that matter. 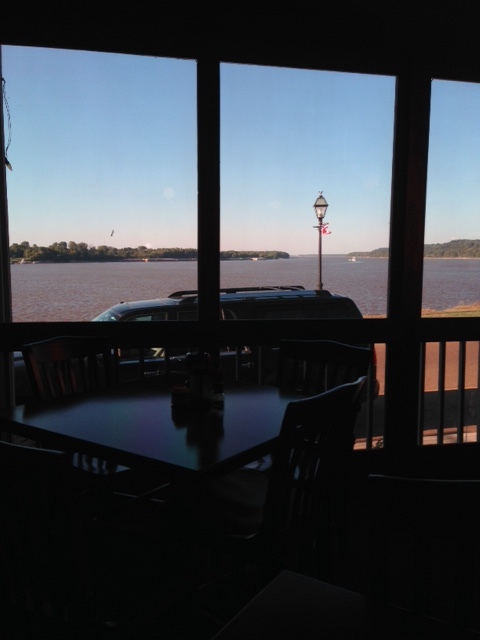 This is a precious little joint with a great view of the cozy town of Natchez. We stumbled across a plaque that seemed to scream our name and our definite theme for this trip. 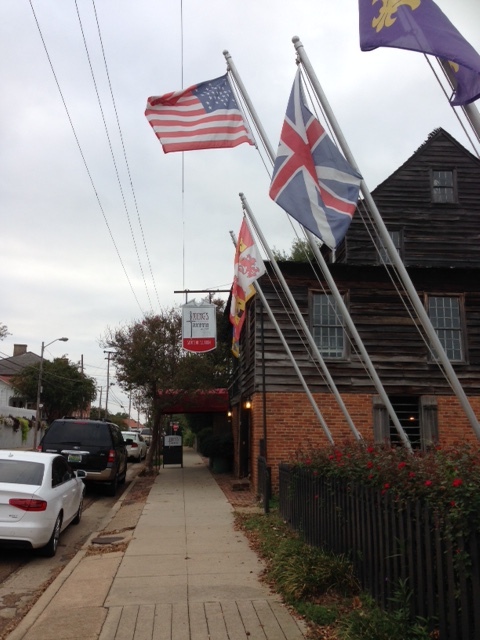 Our last dinner in Natchez was at the King’s Tavern which is the oldest building in the city, circa 1789. It is also apparently haunted and the story involves a mistress, two hit men and skeletal remains hidden behind the fireplace. 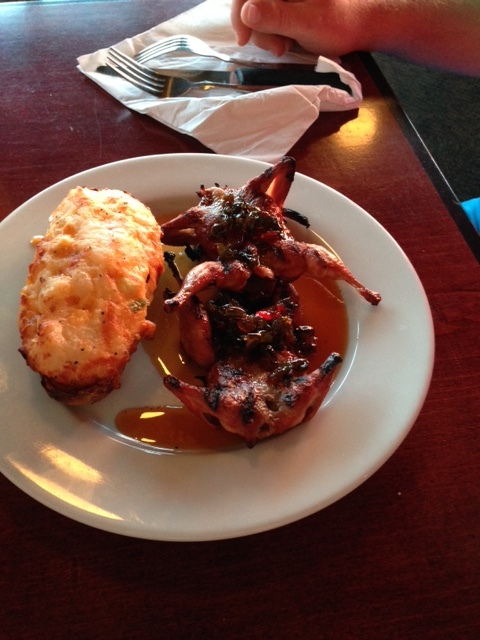 The restaurant is owned by Chef Regina Charboneau who is also the owner of Twin Oaks in town. Although we didn’t go there for the drinks, they are affiliated with the Charboneau Distillery next door and also have a wide variety of beers and specialty cocktails. Even though the menu is limited, the gourmet flatbreads and desserts are divine. 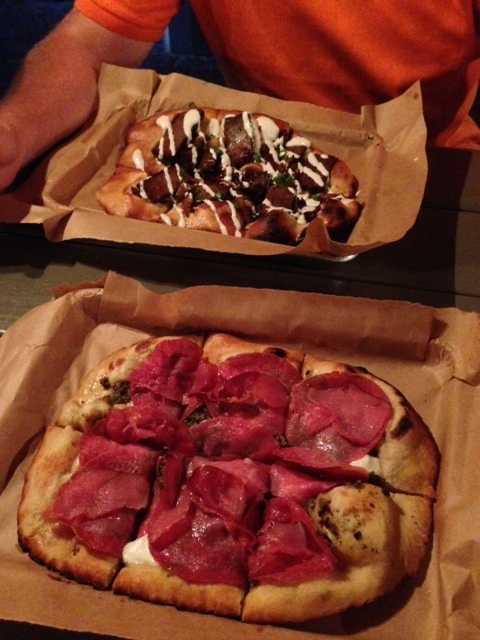 I ordered the Muffaletto flatbread and Andrew ordered the Braised Brisket flatbread. 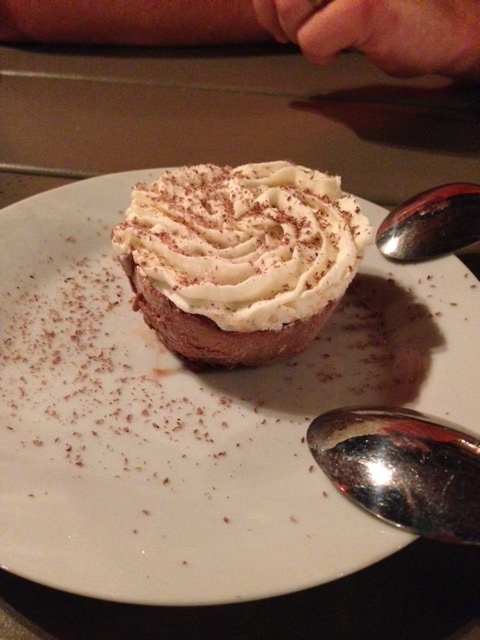 We tried the Black Bottom Pie for dessert which included a ginger snap crust, house made dark chocolate ice cream with bourbon cream cheese topping and yes, it was bliss in our mouths! On our very last morning in Natchez, we decided to view Natchez in Historic Photographs in the Stratton Church at First Presbyterian Church. This exhibit has over 500 astonishing photographs of early Natchez from the Gandy Collection. 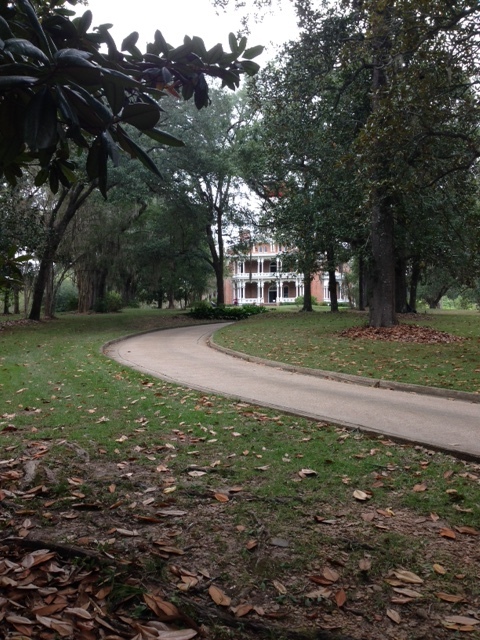 It blew me away to see aerial photographs of the river during different floods, dirt roads in the area which is now known as Natchez Under the Hill, the luxurious steamboats and their massive dining halls, the ranges in fashion over the years and recognizing the Carpenter family which owned and lived at Dunleith. 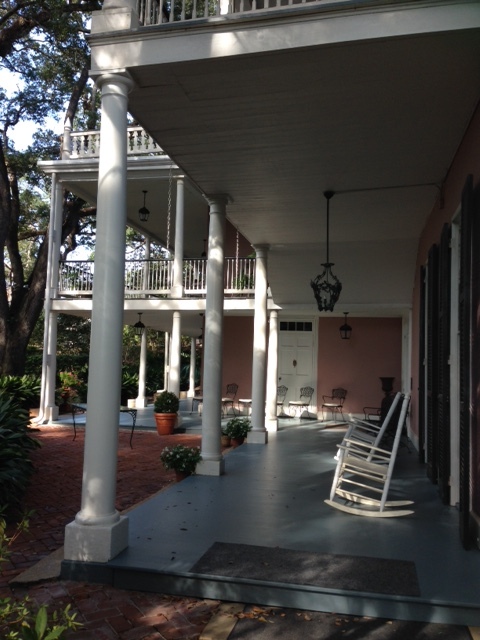 Esther Carpenter’s grandmother and great grandmother are seen throughout the black and white photographs, lounging on the porch of Dunleith, preparing for a Mardi Gras ball, etc. There is so much history all in one place. If I could do it all over again, I would have visited this exhibit at the beginning of our trip. My time in Natchez with Andrew was exactly what we needed at this stage in our marriage. It was a nice break from the hustle and bustle of life where we could enjoy good food, spend some time in the great outdoors and reconnect with one another. We celebrated a milestone following a season of great struggle in our marriage and I am grateful for this time together. We didn’t have to go far away or spend tons of money doing fabulous things to have a good time. We just drove to our next door neighbor Mississippi. 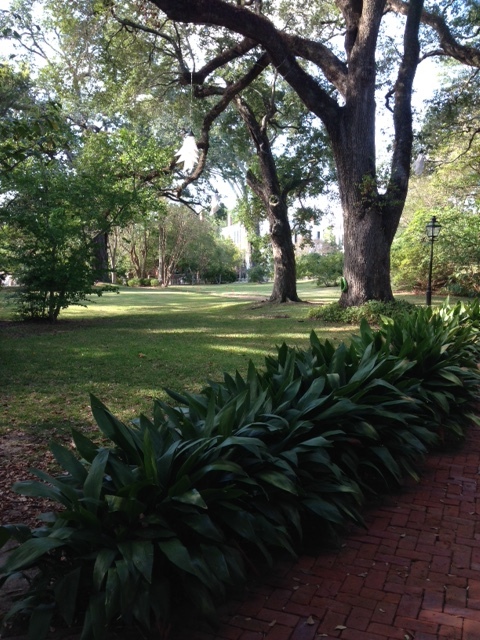 It was nice to enjoy each other, one on one, with all of our little quirks, in the charming and cozy town of Natchez. Thank you Natchez for treating us so well.